Highest Position : 1 ... from 31st May for 2 weeks. Detail : Paul's twelfth solo venture, truly solo, 10 years after the first "McCartney" album. Entering at number 1 is a great achievement, but, hadn't there been better releases before this one, that had NOT reached the upper echelon ? ... Fortunately the single "Coming Up" had been released one month earlier (successfully), and with it's tremendous video, people were obviously keen to buy the album to accompany the smash single. 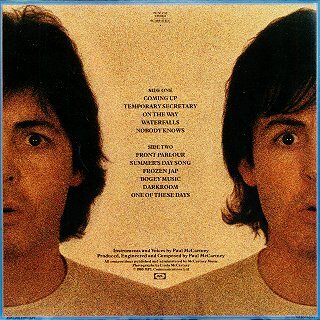 As with the "McCartney" album of 10 years earlier, Paul recorded this release completely solo, except for Linda's backing vocals on the last track. The sessions for the album actually produced over 20 songs and originally this release was going to be a double album. But with prudent editing emerged as a single L.P. The tracks were recorded WITHOUT a mixing console, with all microphones plugged directly into the back of the Studer 16 track tape machine at chez Macca. And in almost every case, Paul laid down backing tracks with bass, drums and guitar and added the vocals subsequently. "Check My Machine" - The first song recorded, but left off the album, later appears as a B-side. It starts off with some odd sampling noises, the first in a Frog voice says, "Hi George", reply "Morning Terry", and then what sounds like Barney Rubble from The Flintstones saying, "Sticks and Stones ..."
"Secret Friend" - The longest song Paul has ever recorded, at almost 10 and a half minutes long. Later appears as a B-side. "Wonderful Christmastime" - A later smash hit single. "All You Horseriders" - featured in the MPL documentary "Blankit's First Show" about Linda's horses. This is first shown on BBC2 on 12th July 1986. The cover photography is by Linda, and for the first time in many years we see the black and silver Parlophone label appearing on McCartney vinyl. The inner sleeve has a picture of Paul on one side, with the lyrics on the other. Temporary Secretary McCartney A song (quite clearly) in the form of a letter to the Alfred Marks employment bureau, who after hearing it, asked permission to use the song in a radio advert. On The Way McCartney Paul recorded the backing track for this, then left it for one week. During that week he was influenced by a BBC programme about Alexis Korner, and transformed the track into a more "bluesy" number. Waterfalls McCartney Originally entitled, "I Need Love". Frozen Jap McCartney Is this Aneka ? ... very similar sounding. One Of These Days McCartney A very pleasant ballad .... but ... The ONLY track I can think of by Paul, where the title appears in better form elsewhere. 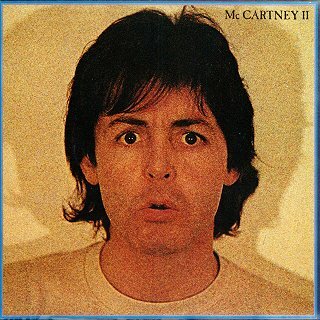 Further Issues of "McCartney II"
There is also a cassette version released on the initial release date, TCPCTC 258. The Original L.P. and cassette are ... deleted in 1986. September 1987, the next listing is on the Fame label, FA 3191 (+ TCFA 3191). The front cover "booklet", only opens out to three cheapo pages containing just the pictures seen on the album. "Secret Friend", the B-side of "Temporary Secretary". 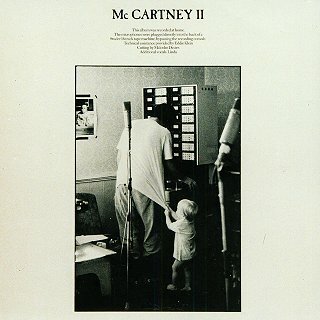 31st January 1988, "McCartney II" is deleted from the E.M.I. catalogue. And the smash hit single "Goodnight Tonight".